Thread hundreds of beads per minute! 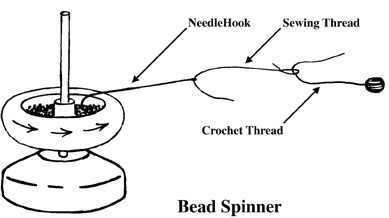 Pour your beads into the Bead Spinner dish, set your needlehook on the surface of your beads and spin the rod. It's just that easy. The first time I saw this product I laughed until I saw 100 beads inch up the Bead Spinner hook and on to my thread in just seconds. I was sold. I am now selling the Bead Spinner without needle-hooks for those of you who are making the French Wire Beaded Flowers.